The ferry from Tingwall lands at Trumland Pier. Here is the Trumland Visitor Centre, which also doubles as the ferry waiting room. Overlooking the pier is the Pier Restaurant and bar. 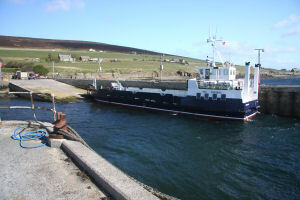 The ferry serving the three islands of Rousay, Egilsay and Wyre is the MV Eynhallow, named after the uninhabited island home only to a ruined monastery that lies at the north west end of Eynhallow Sound, between West Mainland and Rousay.